The Church of San Vitale in Ravenna, Italy is a unique Byzantine style octagonal building built in the mid-sixth century under the sponsorship of Justinian and his wife Theodora, who are memorialized in mosaics in the church. The church is a reminder of the Eastern Roman, Byzantine, Christianity presence in Italy during the time when the Arian Visagoths controlled much of the West. The church is built on the site of St. Vitalis’ martyrdom. The Church of San Vitale dates from the early sixth century. Construction began in 526 when Orthodox Bishop Ecclesius was bishop of Ravenna. The church was completed in 548. While Giulianus (Julius) Argentarius, who may have been a banker, is believed to have financed construction of San Vitale, it is believed the Emperor Justinian was also deeply involved. The church was built during the era when the emperor controlled much of Italy that previously had been conquered by the Visgoths. The church is built on a plan of a double octagonal shell with a domed octagonal core. Byzantine-style mosaics cover the interior of the church. The mosaics in the apse date from 526 to 547 and present an image of a clean-shaven Christ. On each side of the apse are two mosaic presentations of the emperor and empress with their entourages. On the left side is the grouping of Justinian with Abp. Maximian of Ravenna, holding a jeweled cross, other men holding other liturgical objects, and Justinian holding a large golden paten. 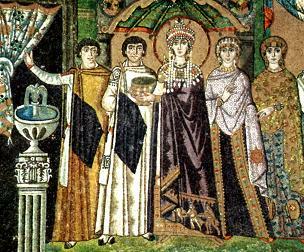 On the right side is the mosaic of Theodora and her court with the empress holding a chalice. Also in the apse is a mosaic on the left side of which St. Vitalis is shown receiving the crown of martyrdom from a beardless Christ. While on the right side of the mosaic Christ is receiving a model of the church from Bp. Ecclesius. The construction of San Vitale apparently extended through the episcopates of at least three bishops: Ecclesius (c.522 to c.532), Victor (538 to 545), and Maximian (546 to 556). This page was last edited on October 21, 2012, at 21:06.